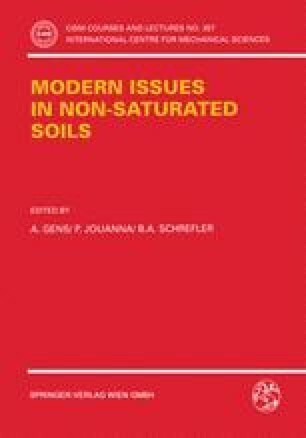 Constitutive laws for unsaturated soils under nonisothermal conditions are presented in this Chapter. The development of the models is carried out in a progressive manner. First the Cam-clay constitutive law for saturated soils is briefly described. Using net stress and suction as independent stress variables, the Cam-clay model is generalized to include the effect of partial saturation. Some consequences of the model are reviewed and its prediction capabilities are tested in relation to some selected experimental results. Finally, the model is extended to include temperature effects. A suite of constitutive laws is therefore obtained capable of reproducing increasingly complex features of soil behaviour. Important advantages ensue from the fact that they can be regarded as progressive developments within a shared strain-hardening elasto-plastic framework.